Last time we hung out together, we talked about ways we sometimes don’t actually listen. Something I’ll unpack a little more at the CU Water Cooler Annual Symposium next weeks is the idea of servant leadership. With those two broad ideas in mind, we’d all probably agree that what is commonly referred to as active listening is the preferred type of listening, right? But what if active listening is really just the baseline level of acceptable listening rather than the ultimate destination point? What if, instead of us viewing active listening as something to achieve, we look at it as more of a basic expectation upon which we build and grow? 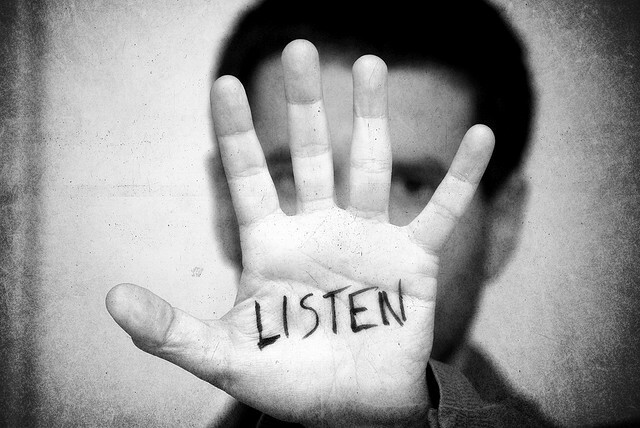 There are at least three levels of listening that can be layered on top of active listening. This might be closest to what’s typically referred to as active listening. We hear what’s being said, understand its intent, and respond accordingly. This is productive, respectful listening. This bears all the hallmarks of active listening. We’re engaged, there’s eye contact, we’re not interrupting, and so on. Now don’t skip this one because you’ve heard this word tossed around all the time. It’s not nearly as simple as we make it out to be. “I know how you feel” isn’t empathy. “Walking a mile in someone’s shoes” isn’t empathy. It may often be more akin to the pretending we chatted about before. Resist the urge to speed past this. When my professor first explained what empathy actually is, it knocked me completely on my – how do the French say it? – derriere. As he explained it, empathy involves “reflecting and experiencing other people’s feelings and states of being through a quality of presence that has the consequence of their seeing themselves with more clarity,” even without any words being spoken. Do you get how huge that is? View the situation from the other’s point of view. What do they want, whether it’s been plainly stated or not? What are they feeling? Not what would I be feeling if I were them – what are they feeling? We also strive to hear the intention behind the content with sincerity and respect. Empathizing enables us to respond by facilitating the other person’s intention (a response is not a defensive reaction). We do this by attempting to see the big picture and respond with the idea of maintaining a long-term relationship within which we can serve and care about the other. Generative listening is a creative act. You become a finely tuned receiver that picks up what currently is, and also what wants to be, communicated. Ideas and solutions that you hadn’t considered before may simply emerge, at least in part, because your stubbornness and ego are in check. By letting go of preconceptions and biases; you’re able to sit patiently in the “not knowing,” unthreatened by differences of opinion. This allows the act of listening to birth something truly original and worthwhile. The notion of silence is another aspect of generative listening some refer to as generative silence. Some find silence awkward or oppressive, but a relaxed approach to dialogue will include the welcoming of some silence. It is often a devastating – but very important – question to ask ourselves: If I say what’s running through my head, will I really improve on the silence? So, you see, when we begin to listen in these ways, our listening becomes so much more than simply “good communication.” It becomes a vehicle to serving the other. It evolves into a way we help others grow taller. This entry was posted in Leadership and tagged human leadership, lead, leader, leaders, leadership, listening, servant-leader, servant-leadership, service. Bookmark the permalink. When I first heard that, I realized how often that’s true of me. I’ve experimented with my family and friends and discovered that my and everyone’s tendencies is to desire to speak immediately after another finishes. Listening is an art that takes skill and practice. The main reason is that it takes practice is that while everyone listens in their own unique way most of suffer from the voices in our head that are in constant action while others are talking. Thanks for the concrete ideas and tools to help improve listening. Great topic since listening IS so important to leadership!! i am so glad you have reminded us of the imporance of listening. After a conversation has to include listenting else it is just two sequential monlogues. Might I take it one step further? Level 4 might be called intuitive listening. Here we are no longer restricted to the physiological hearing that our intellect filters and interprets. At level 4 we are absorbing all the visual and tonal clues from our partner. We are also sensing their emotional state by the way that our own alters in response. emotional underpins everything we do and if you seek to understand someone at the emotional level we are less likely to provide solutions to problems that may not exist. Listening is the art and practice of putting someone else’s speaking, thinking, feeling needs ahead of your own. This means letting others speak before you speak, think before you tell them what they ought to do, and feel before you judge or change the subject because you’re bored or have something more important to do. It’s “active” because you have to consciously make it easy and rewarding for someone else to think, feel and speak.